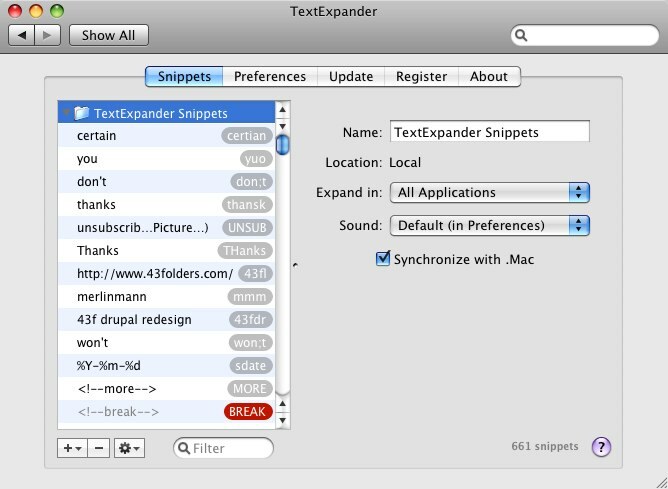 Mmmm..."Synchronize snippet groups using .Mac synchronization." I like the sound of that one quite a lot. In fact, I wonder if one way to get me whining less about syncing would be for more apps to include built-in .Mac sync. TextExpander had been high on the list of contenders for adding syncing; believe me, you don't want to try and keep 661 abbreviations synced up with spit and bailing wire. Also, for folks who have a large library, the addition of "most recently used" sorting is swell. Also loving the idea of keychain support (although I haven't tried that one yet). If you're the sort of person who's struggling to get faster on your Mac, definitely start with TextExpander. You can shave minutes off every hour with this guy. I probably save an hour a day just not having to fix "thnaks" and "Melrin."